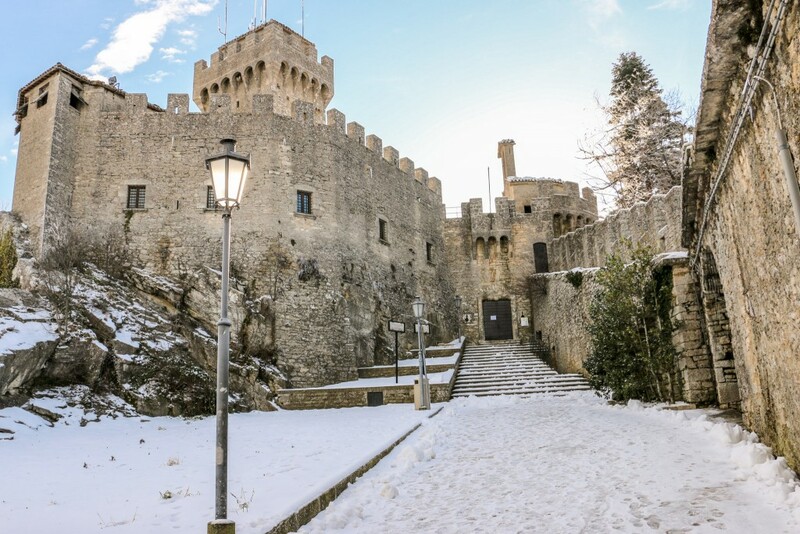 Early this year we went on a winter weekend getaway to San Marino, the oldest republic in the world and the 3rd smallest country in Europe! 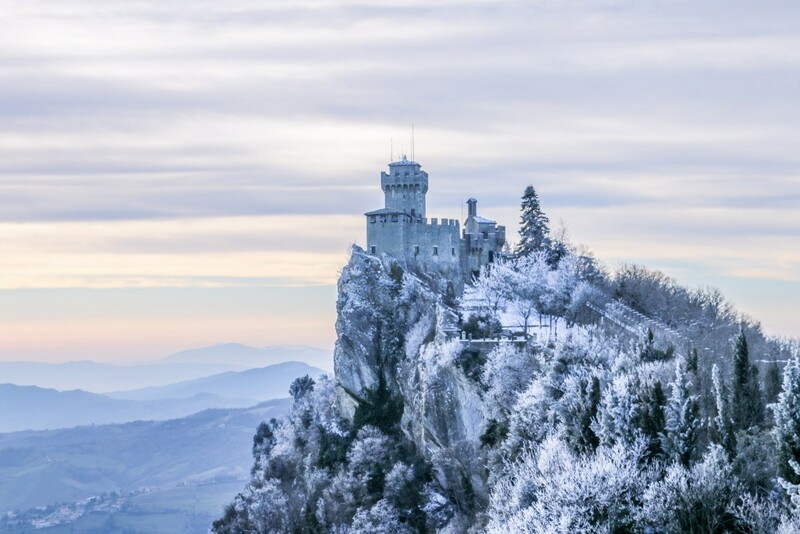 San Marino is a tiny country completely surrounded by Italy but is not part of it, although they share a lot of common ground, including Italian as the official language. 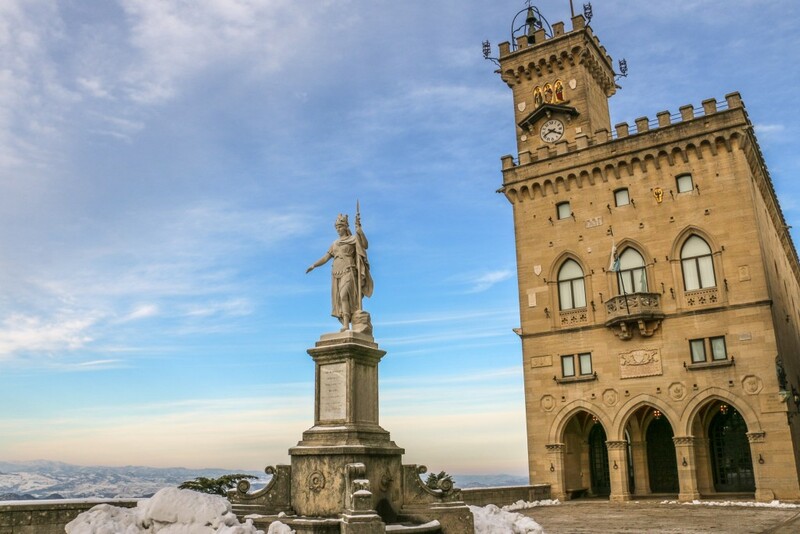 So, why visit San Marino? 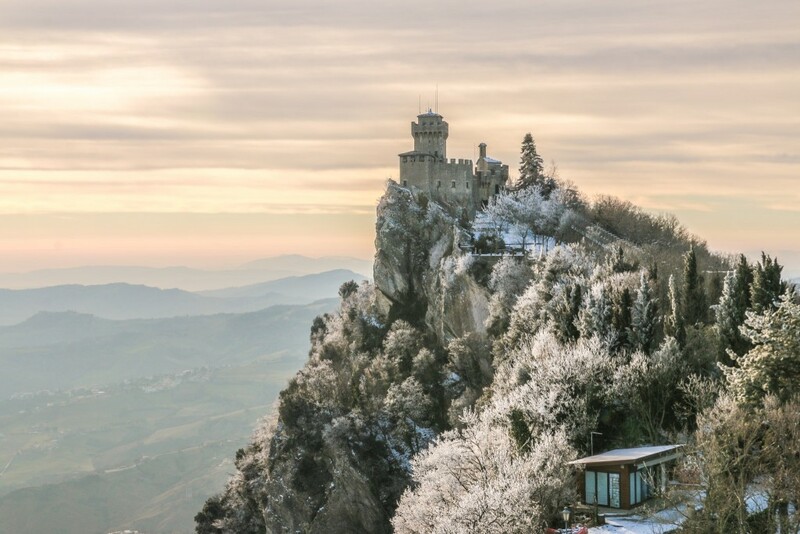 This hilly country is best-known for its beautiful capital (conveniently called City of San Marino or Città) which sits on the slopes of Monte Titano with its distinctive three towers. Plus, the historic centre is a World Heritage Site. One thing we weren’t expecting for this weekend was the snowstorm that hit the region a few days before we arrived. This turned out to be a very snowy experience! 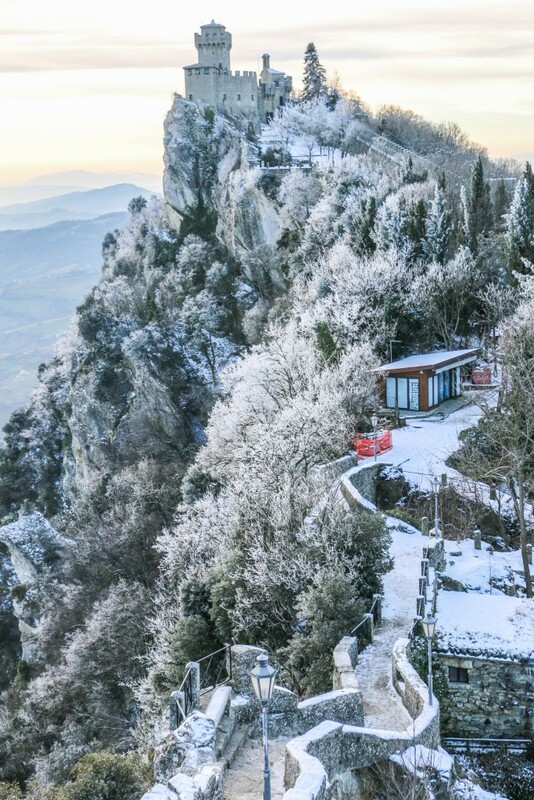 The photo above shows the view we had when we arrived in San Marino. This was facing the Italian mountains. Snow makes everything look quite nice! Not long after we arrived, and while still trying to adjust our feet to the snow (we’re from a country with pretty much no snow! 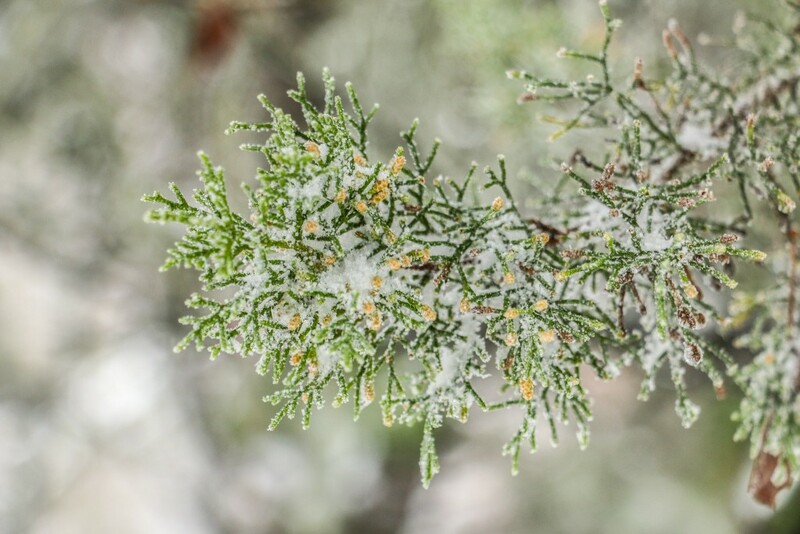 ), the weather started to deteriorate and soon we could barely see anything other than fog and snow. While this wasn’t exactly in our plans, we made the most of the situation. The walled historical centre and its winding and steep cobblestone streets are perfect for wandering around. We explored the streets while secretly hoping for better weather the next day. Our very own scouting mission. Needless to say that no one else was around except a few locals. It’s with weather like this that Museums are even more useful. We used our time to visit Museo di Stato (National Museum), which houses a few different and interesting collections. Before calling it a day and while on our way to the hotel it started to snow again! Luckily on the next day we woke up to amazing winter weather! A cold day with clear blue skies. Perfect to put in practice what we discovered the day before. Our hotel was at the foot of Monte Titano and to get back to the top, we used the funicular. Not only it’s extremely useful but it also boasts great views! 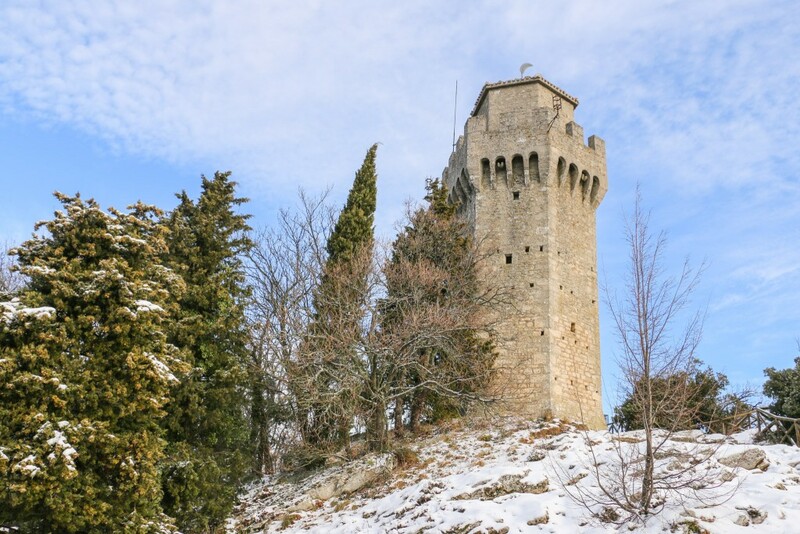 San Marino’s most famous attractions are undoubtedly the three towers standing on the peaks of Monte Titano. So famous that they can also be seen on the national flag. The views to and from the towers are truly spectacular. 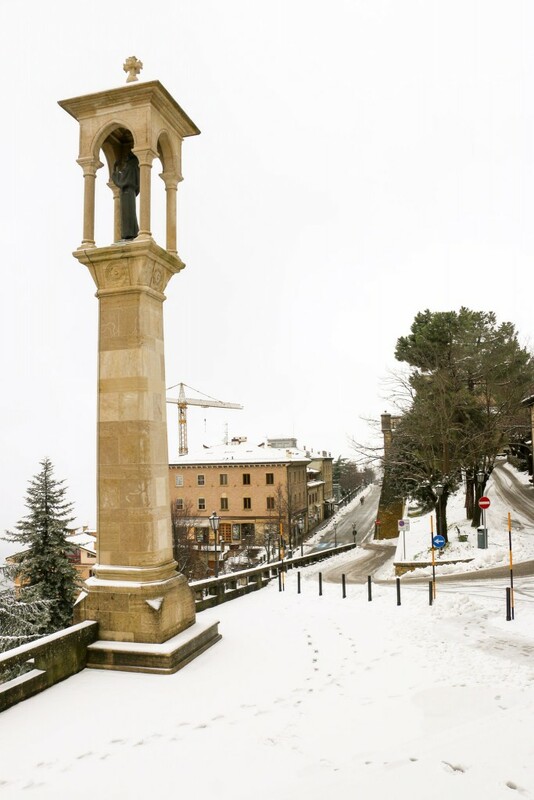 In order, from the centre of town, the towers are Guaita, Cesta and Montale. The first two can be visited. Guaita is the oldest of the three and was built in the 11th century. 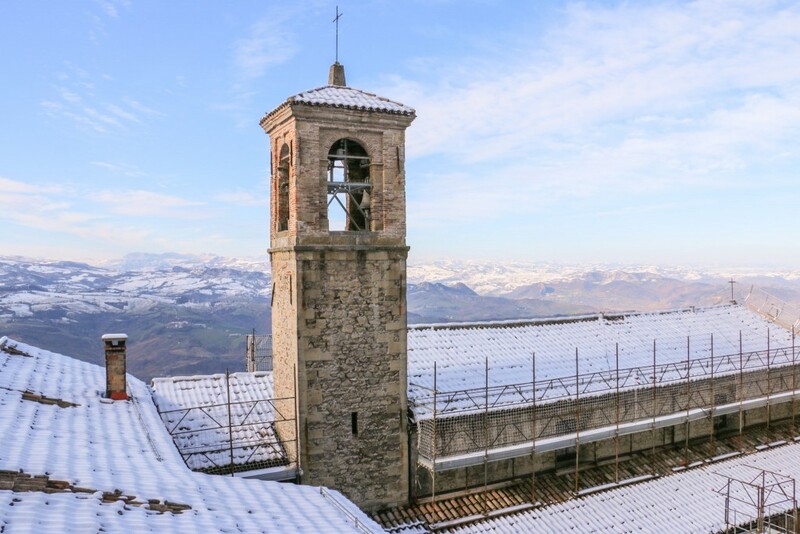 Cesta was built in the 13th century and sits at the top of the highest peak of Monte Titano. It houses the Museum of Historical Weapons. Montale is the smallest one. A former prison, it was built in the 14th century. Back in the historical centre, the best way to explore it really is to just wander around the cobblestone streets. Plenty of things to discover around every corner. Two mandatory stops are Piazza della Libertà and Basilica de San Marino. Piazza della Libertà is stunning both because of its main building – Palazzo Pubblico, and also due to the views. 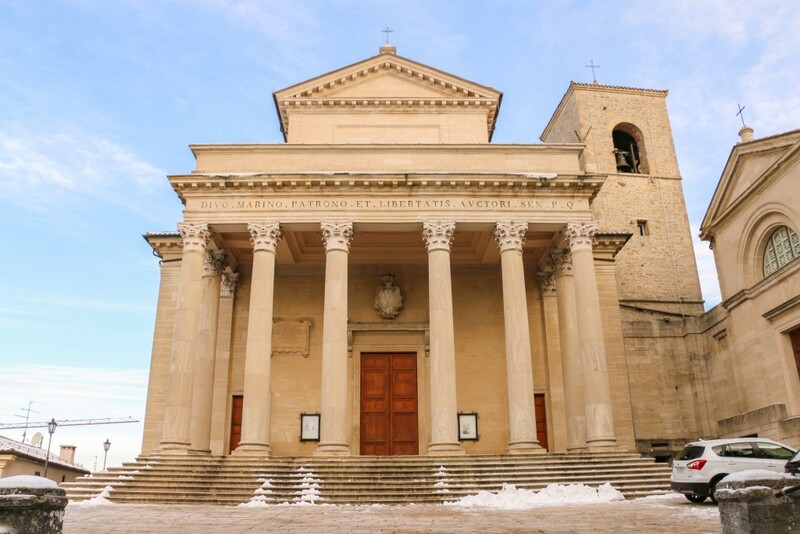 The Basilica is the main church of San Marino and has a nice looking architecture. There are no trains or flights to San Marino and the only way in is by car. 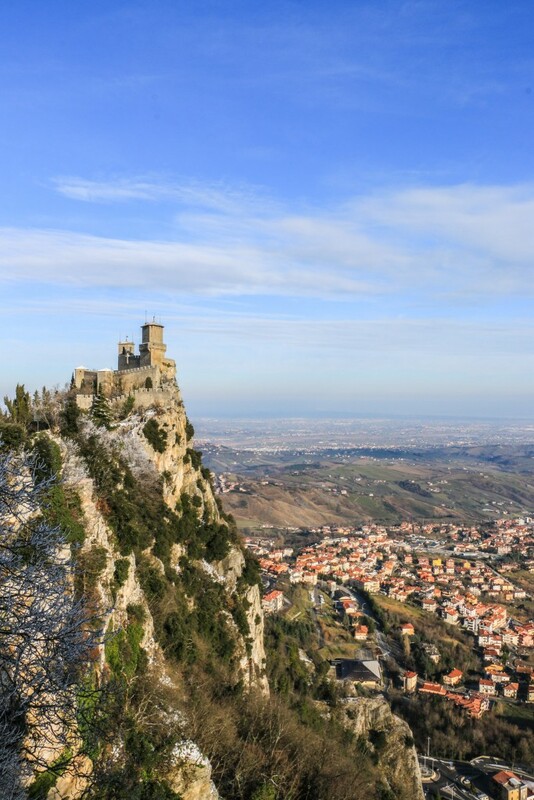 The best option is via the neighbour Italian town of Rimini which has a regular bus service to San Marino. The bus departs next to the train station and tourist office, and the journey takes around one hour. 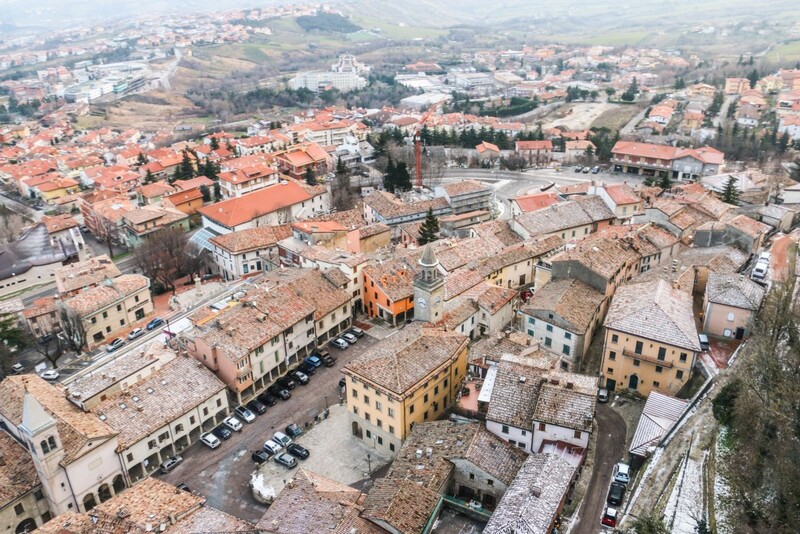 Rimini has an international airport, but there are other airport choices nearby such as Bologna and Ancona. Both with train connections to Rimini. For our weekend in San Marino, we flew into Bologna from London, took the train to Rimini and, finally, the bus to San Marino. A little surprise. Here’s the video from our trip! 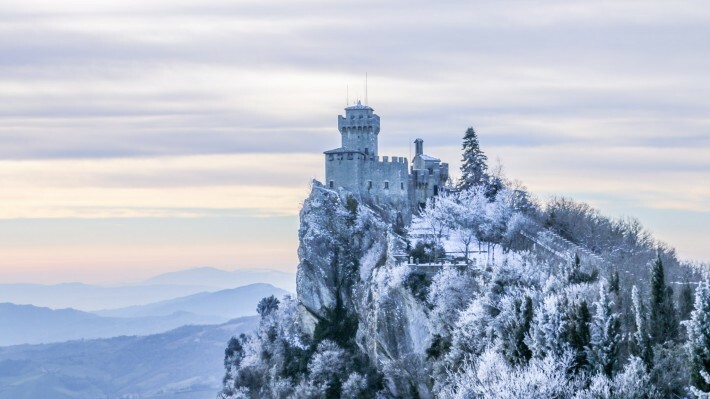 Have you been to San Marino? What do you think about it? 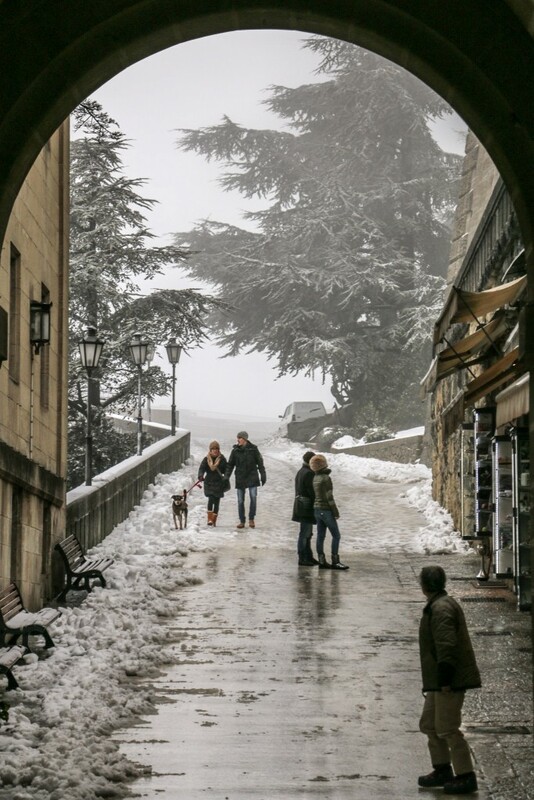 I have always wanted to go to San Marino, snow storm or not. It is just one of those OMG places as your pictures show. Yes, a very unique place! Some really stunning pics in this great post. I am a little embarrassed to admit that I have never heard of San Marino until now. But wow, gorgeous! I’m sure trudging around in the snow wasn’t what you had hoped for but I am glad you braved it. The photos are amazing! What a pretty city! Now you know about it! It’s a tiny European country landlocked by Italy and lots if people think it’s part of it, which is not the case at all. WOW! This place looks magical. Our CS Host actually just mentioned this place. If we had more time here in Italy we would have gone. 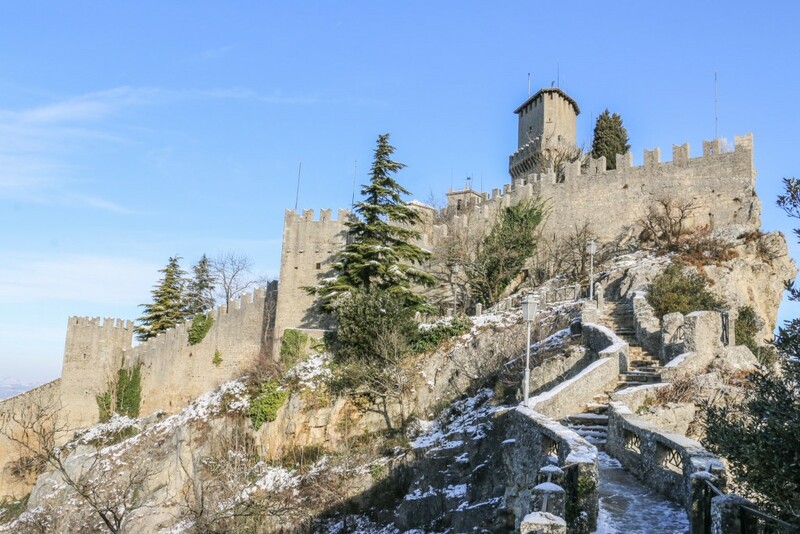 Next time you visit Italy, pay a quick visit to San Marino! Wow San Marino looks beautiful! 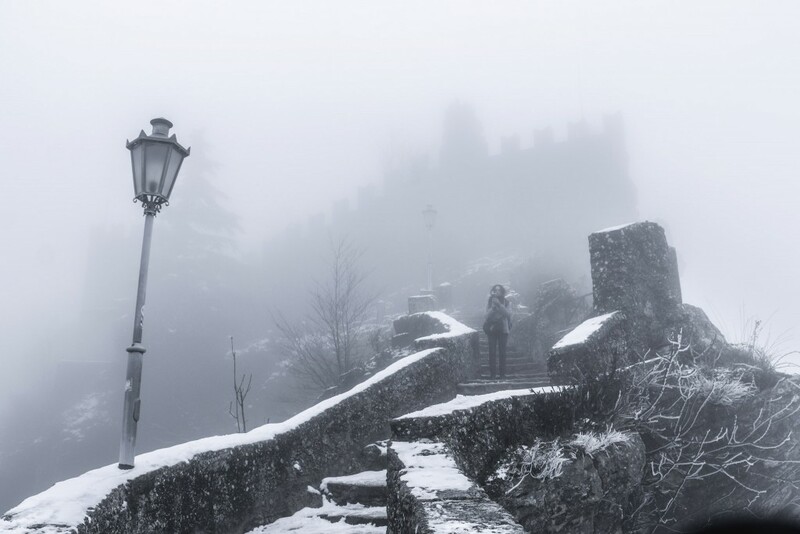 It was lucky the weather cleared up for you – we had a similar situation when we drove to the Grand Canyon in the US – hit a freak blizzard and couldn’t see anythign in front of us expect white and fog even though we were standing on the rim!! I would love to visit here during winter instead of summer even though you might risk a snow storm. I think the snow makes the historic buildings look absolutely magical. Buildings in the snow are great! We were quite lucky on the second day otherwise it would have been a bit disappointing. It’s part of winter travelling. What a shame that happened when you went to the Grand Canyon! We’ve been quite close (Las Vegas) but didn’t have enough time to drive there. Wow, didn’t know there was such a country. The three towers are stunning! But I think I would rather visit in the summer. Why is it a separate country from Italy? They have been a separate country for many years. The constitution is 500 years old! The fact that they are landlocked and quite small means they have to deal a lot with Italy. I was in San Marino many years ago, it was actually during my first trip abroad 🙂 it was summer. Looks beautiful! Should include it in my plan! Wow! I’ve never really thought of going to San Marino although I’ve been to Italy 3 times now. Didn’t really know it’s that beautiful! I especially love photos of Cesta Tower above. Seriously beautiful! This is where you need to go next time in Italy! Yes i love San Marino beautiful views and cheap shopping spree too. Wow this place looks beautiful! 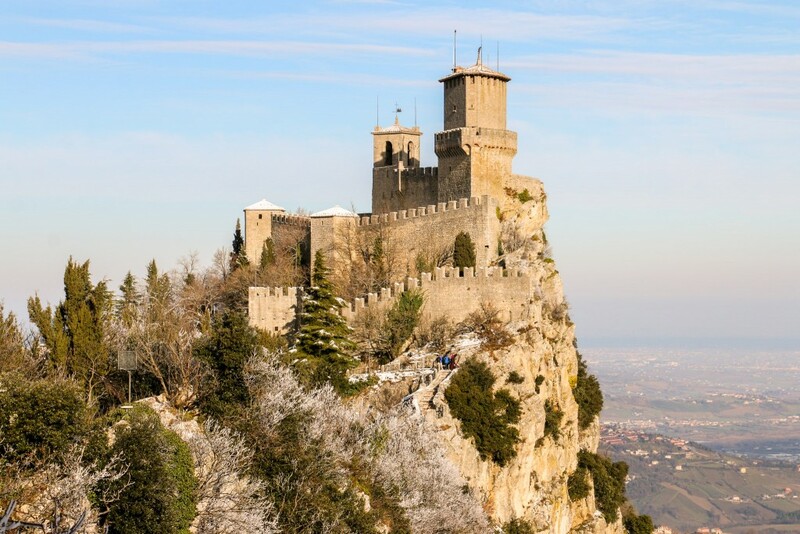 I had been to San Marino when I was a kid on our way to Italy from Spain by bus. These towers are a fairy tale location and the snow made it look so magical. Now I actually want to visit this little place again! Glad to see someone here that has been to San Marino! How beautiful! Those views are gorgeous! Your photos are beautiful!! I had heard of San Marnio but had no idea where it was. Next time I’m in Italy I will absolutely try to go, even if for a day trip! Even in the snow it looks like an amazing place to visit. Day trip is perfectly fine to visit. It’s a small place but totally worth a visit next time you’re in Italy. So nice! Could you tell us the date you traveled? We travelled in February last year. 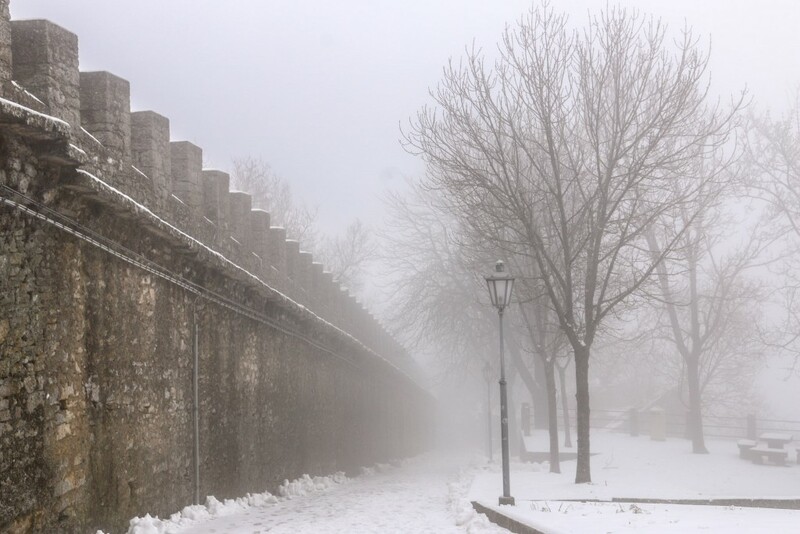 This was really helpful for planning a honeymoon in Italy in the winter. Thank you for the beautiful pictures! Would you guys have braved driving your own vehicle if you had the option? Just wondering because we were planning on having a car but now sure of the road conditions in winter. We’ve driven in the winter but, this time, we took public transport. Train + Bus. There was only snow at the top. The rest of the roads were clear. Your pictures are beautiful. 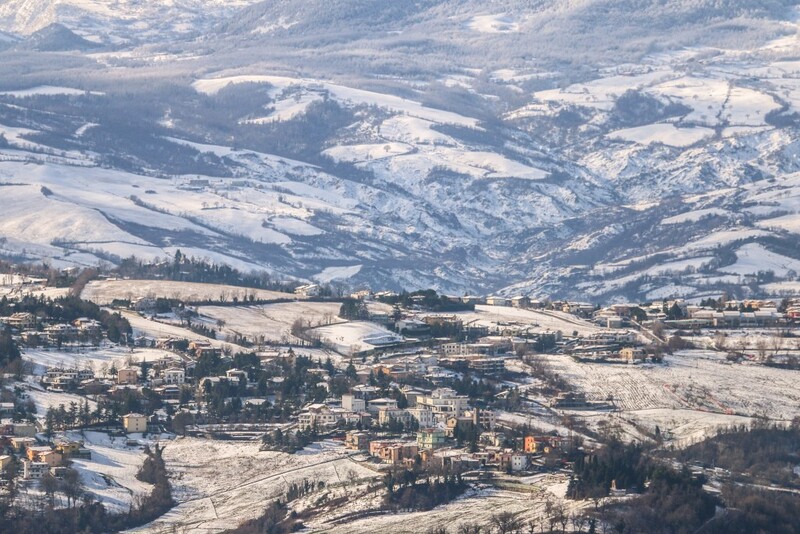 We are heading to San Marino from the US(stopping first in Bologna) December 2-4 then heading to Rome. What hotel did you stay in? Was 1 day enough time to see the museums and shopping? We also traveled from Bologna!